How does Charity Storage work? Participating storage operators dedicate a storage unit from inventory as a collection point for donated goods. Departing tenants, current tenants, auction buyers, and local residents and businesses can donate items to the Charity Storage Unit and receive a tax deductible receipt. 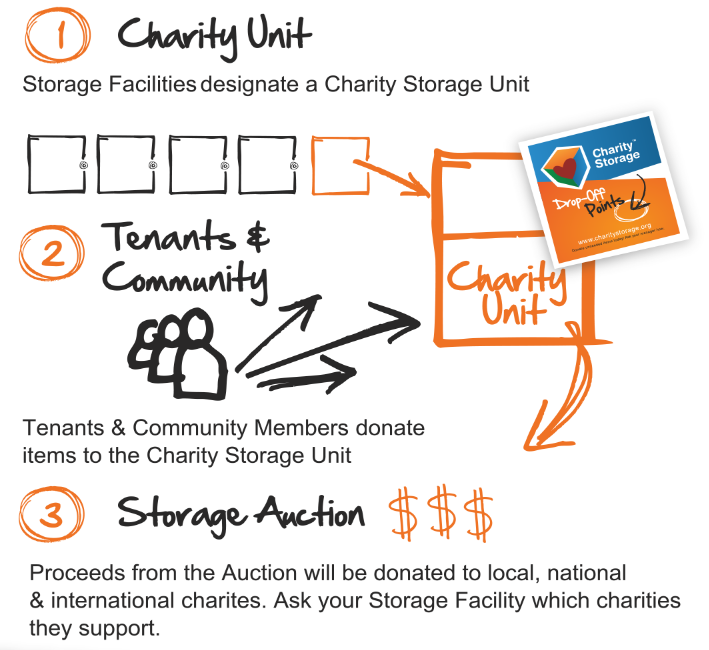 When the storage facility holds a public auction the Charity Storage Unit is sold either on site or online with Storage Treasures.com and the revenue allocated to local, national, and international charities. It’s really simple: the Storage Industry has the space, donors have the items and Charity Storage organizes the effort to convert these items into cash to support local, national, and international charities. What is the difference between a Lien, Non-Lien/Manager Special and Charity auction?